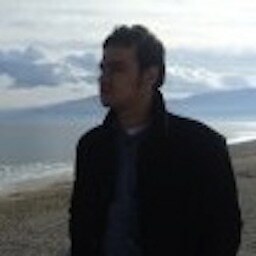 Georgios Zampaklis was born in Thessaloniki in 1988. He started his music studies at the age of 7 in accordion with B. Ioannidis. 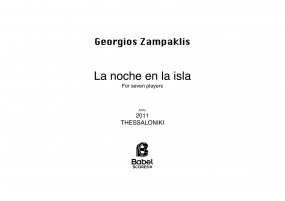 He has also studied Harmony (2002-2005), Counterpoint (2006-2007), Fugue and Orchestration (2008-2009) in Municipal Conservatory of Stavroupoli with P. Bekiaridis. In 2006 he initiated his studies in music at the Aristotle University of Thessaloniki, Department of Musical Studies. In 2008 he was accepted in the Department of Composition (4th year) and he is studying Composition with Christos Samaras. He was awarded with the 1st prize at the 1st and 2nd Panhellenic Accordion Competition (2005 - 2007) in junior and senior category respectively. In 2010 he was awarded for his improvement in his degrees, by the Department of Music Studies of the Aristotle University of Thessaloniki. 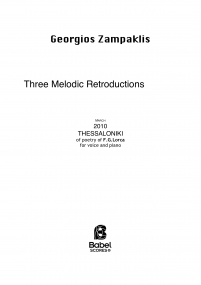 As a composer he was awarded with the 1st prize, in the 4th Panhellenic Composition Competition in memory of D. Dragatakis (2010) with the work ‘’In Memoriam…’’ from Greek Composers Union. 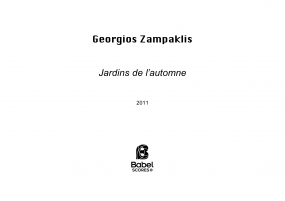 In 2012 his work …Jardins de l’ Automne… has been selected as finalist for the Eight Thailand International Composition Festival (TICF 2012) among 87 participants and also he was selected as finalist at the 3rd International Antonin Dvorak Composition Competition in senior category. In the same year he is selected to be a member of BabelScores - Contemporary Music Online after a call for works. Additionally, his music activity includes workshops, seminars and masterclasses held in Greece. In 2011 he took part in the 5th Workshop of Contemporary Music at the Concert Hall of Thessaloniki. Also in 2012, he participated in the 12th Workshop of Contemporary Music ‘’Dialogues’’ at the Concert Hall of Athens. 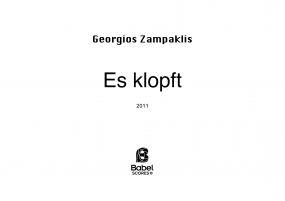 In 2011 and 2012, he participated in composition seminars and masterclasses with Beat Furrer, George Aperghis, Zhou Long, Eric Moe, Xiaogang Ye, Narong Prangcharoen, Kostas Tsougras, Kostas Siempis, Vassilios Kitsos, Theodoros Antoniou and Christos Samaras. 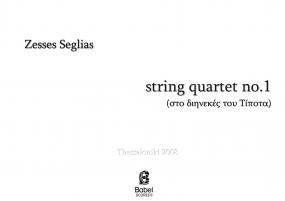 He has also collaborated with ensembles such as the dissonArt ensemble (GR), Greek ensemble of contemporary music (GR), TICF players (TH) and others.